Labour Pains: Pain is Mainly in the Brain. Labour Pains: Is Pain Mainly in the Brain? Really? Are Labour Pains Mainly in the Brain? We know that people have different “pain thresholds”. And the more I learn about pain the more I realise that “Pain is mainly in the brain”. Think about Phantom Pain, feeling pain in a limb that actually isn’t there. So people actually feel pain beyond their physical body. But what has this got to do with birth? We are so programmed to expect pain during birth that is becoming a self-fulfilling prophecy. I have just listened to this great “All In The Mind” podcast from ABC Radio National. In the podcast Professor Lorimer Moseley, who is a professor of clinical neurosciences at the University of South Australia, explains that when we feel a sensation it is passed through message gates to the brain, that open and close to let the important messages through. He says that the main message being looked for isn’t pain; it is “danger”. And that opening and closing of gates happen as the brain is deciding if there is a need to protect your body tissues from danger. So any evidence the brain has that your tissues are in danger increases your experience of pain and any evidence that your tissues are safe decreases, the intensity, and sensation. So if we believe birth is unsafe and something is bound to go wrong (because that is the message we are constantly being bombarded with), we will be sending “evidence” to our brain that our tissues aren’t safe. Professor Moseley mentions a couple of studies about how our perceptions affect how we experience pain. Firstly he talks about the fact an MRI scan leads to increased pain. This is because the report is full of dangerous sounding words, that have to be reported on but are in fact normal. But the layperson doesn’t know this and internalises these words and tell their brain that their tissues are in danger. Think of all the scary words your birth care providers used! Another experiment was giving a very cold stimulus on the back of the hand at the same time as showing either a blue or a red light. The subjects consistently reported that the red light was more painful and also reported a hot sensation, not a cold sensation. This is because we are so programmed to believe “Red” means hot, and hot is more dangerous. Red is actually stored in our neural networks as danger and pain. I really like Professor Moseley’s analogy of the brain as an orchestra. He goes on to say that if you play the one tune over and over again, you get stuck on that tune. 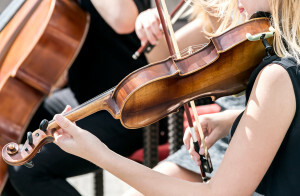 Your brain becomes very efficient at playing that tune and becomes less able to improvise and play other tunes. This actually affects the brain’s ability to protect you effectively and it starts to protect you from something you don’t need to be protected from, ie your contractions during labour and birth. So if the pain in labour really is mainly in your brain, what can you do? You need to change your perceptions about birth being painful because it really isn’t meant to be. Why would nature make the process of continuing the human race so painful and dangerous that we never wanted to do it again? But it is not good enough to believe this on a rational level, you have to really, really believe this… on a subconscious level, and that is where Hypnobirthing Australia can help you. I also don’t think it is enough to think you are going to be able to just practice mindfulness on the day of your birth. Changing your embedded perceptions takes time. Dr. Tasha Stanton a senior research fellow with the Body in Mind research group at the University of South Australia, explains ‘illusions’ as a way for changing perceptions and this is really relevant to hypnobirthing. She states “There is some evidence to suggest that information from one sense, such as touch or vision, can actually modulate the information that is coming from another sense”. We use both touch and visualisations in hypnobirthing to modulate the information that is reaching our brains. Toby Newton-John a clinical psychologist and senior lecturer at the University of Technology in Sydney is also on the podcast explaining the partner’s role in pain. Once again this is a concept hypnobirthing covers. If birth partners understand that birth is a normal, physiological process, he/she won’t be adding to the “birthing mother as a patient who is a helpless victim” perception of labour and birth. Instead, he/she will be helping the mum realise her power and ability to cope beautifully with the intensity of birth. And when birth partners realise the birthing brain is watching out for “danger” not pain, they really rise to their role as protector, making the birthing woman feel safe, loved and advocated for. Have a listen to the podcast and think about how it relates to your perceptions of pain in labour.